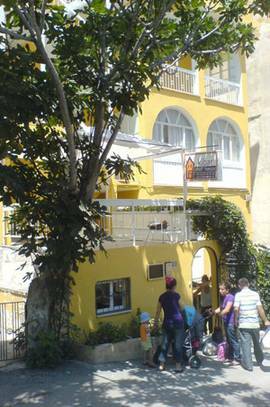 Kibar Apart Pension – a holiday dream wakes up in the Bay of Kuşadası Turkey since ancient times a center of arts and culture. 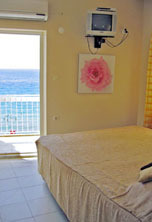 The Kibar Apart Pension is ideally placed in the second row of houses at the beginning of the beach promenade of the popular so-called Ladies Beach (also for men), with six two-bedroom apartments with balconies on the seaside and other holiday accommodation. The view from the terrace is spectacular. From a bird's eye view of the bustle of the beach, beautiful sunsets, moon and starry sky at night and late night a lullaby of ocean waves. The city center is only 1.5 km away removed easily to reach with a dolmus mini-bus. In each apartment you will find a shower room with toilet, 24 hour hot water, satellite TV, air conditioning, kitchenette, refrigerator and much relaxation designating ocean backdrop. The philosophy of the board is like to feel at home. Realize your dreams and enjoy the beach and the Aegean wind and sun. 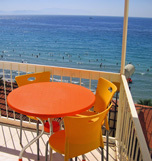 Book a Kibar apart holiday accommodation at Kuşadası, southern Aegean coast, Turkey.